A version of this blog post appears here on Bioregional’s website. On a crisp, early morning a few weeks ago, I took a final stroll around BedZED, my home for the last four years. I’m excited to be moving to the Dorset coast. Yet there are many things I’ll miss about living here and it’s been an important part of my life. 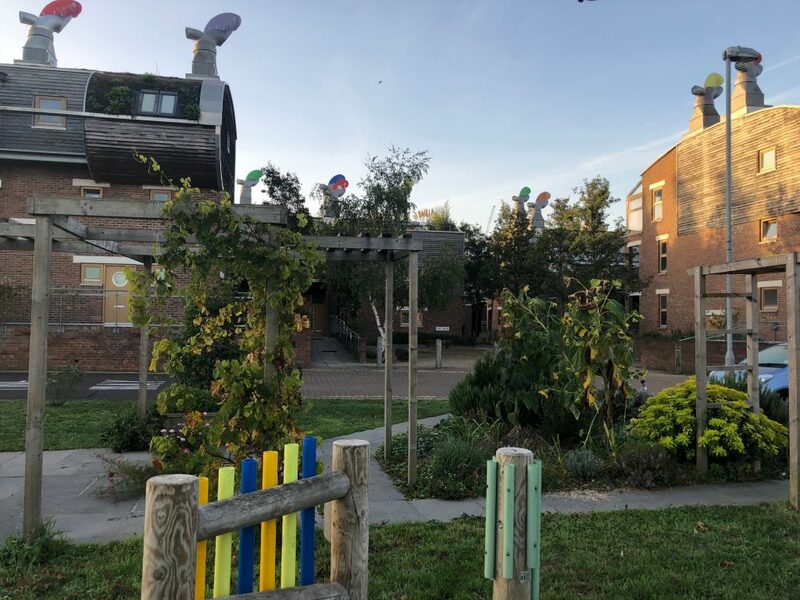 Built over 15 years ago, BedZED (short for Beddington Zero Energy (fossil) Development) is a pioneering 100-unit ecovillage of homes and workspaces initiated by sustainability charity Bioregional in partnership with the Peabody Trust and ZEDfactory architects. I learned about BedZED soon after it was built whilst on work experience at a chemical engineering company in Finland. With very little to do and plenty of time to browse the internet, I stumbled across WWF’s 2004 Living Planet Report which featured BedZED as a case study. Feeling alarmed by the state of our ecosystems, I was inspired to hear of practical actions being taken. I kept a mental note of Bioregional and went off to University to study engineering. 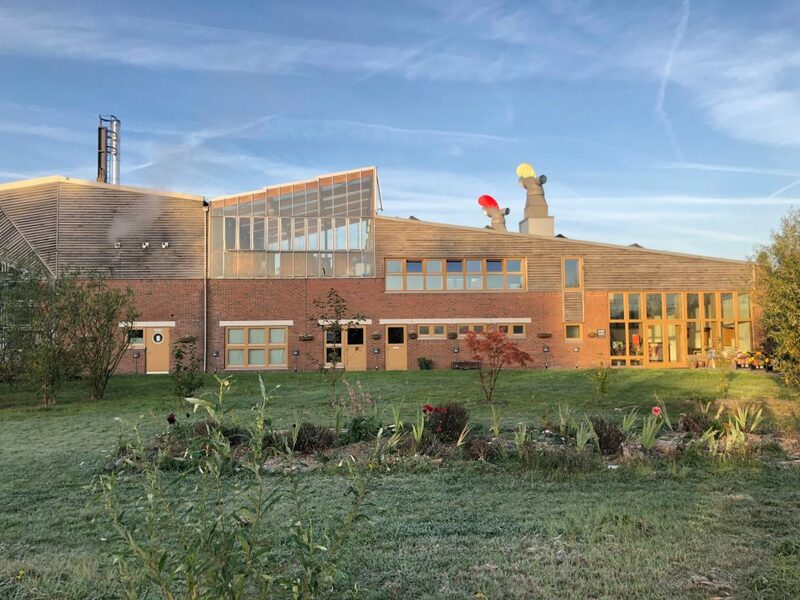 Four years later and eager to pursue a career in sustainability, I was over-the-moon to land my first job at Bioregional. So before living at BedZED, I worked there for several years, commuting in from various leaky homes across South London. One part of my job was being a tour guide for the development. Each week I would take groups around the site, discussing different aspects of the design. Some of our work at Bioregional involved taking the learnings into other built environment projects. We also used BedZED to help inform our understanding of One Planet Living. 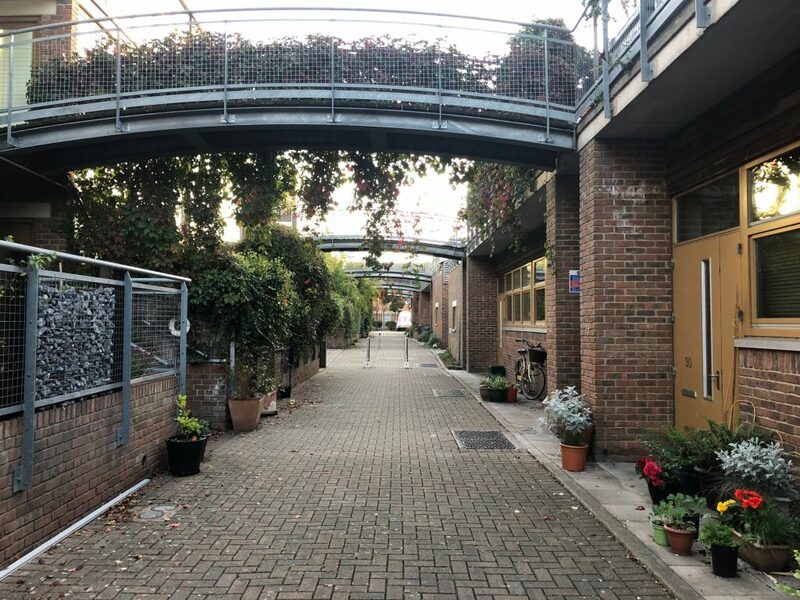 Being based at BedZED felt important for working in sustainability, providing some first-hand experience of the benefits and challenges of designing more sustainable communities. Much has been written about BedZED over the years but less on what it’s like to live there. So as I move away, here are five things that I’ll miss the most. BedZED looks noticeably different from other developments. Its unique character comes from the combination of its colourful tops, curved edges, green roofs, weathered oak cladding, cabin door-windows, walkways, bridges and roof gardens. I find there’s a lot to enjoy looking at. Whenever I’ve explained where I live to other locals they will often say: “oh, that place with the colourful things on the roofs?“. Those distinctive things are wind cowls, helping to provide ventilation for the buildings. They spin around with the wind and you’ll often find a cute line-up of small birds perched along the ridge. They are the most iconic feature. The way that BedZED looks does have something to do with its sustainability but not as much as you might imagine. Curved edges and bridges, for example, aren’t environmental features, rather they are attractive features that would have added costs. 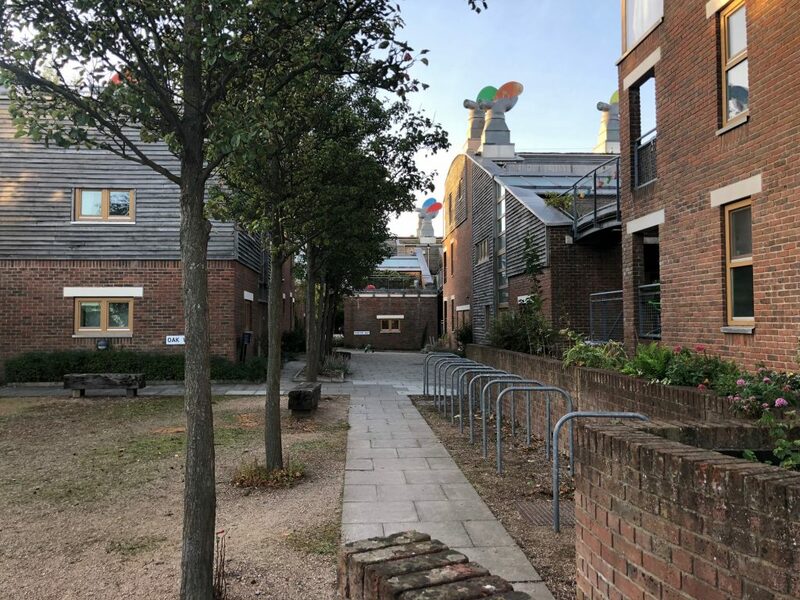 As a comparison, one of the developments Bioregional were involved with after BedZED was One Brighton, which was 172 apartments plus offices. Many of the same principles were applied, yet these flats appear much more conventional and the project turned a profit, which was impressive given that it was built during the depths of a recession. The all-year-round warmth and natural light is one of the most noticeable differences. For the last four years, I haven’t had to think about heating. There was no heating system to turn on! I have found it warm enough in the winter and certainly hot enough in the summer. This is thanks to the homes being south-facing with thick, insulated walls, good quality windows and sunspaces to help trap the heat. Every home should be built like this and it’s a great pity to now be moving to a home that requires heating. Once a month, one of the ex-residents runs a community bar in the BedZED Pavillion. Children play in the field while the adults unwind with a refreshing beverage. Lately, there’s even been a chef cooking dinner too. What a great way to get to know the neighbours. I will miss the BedZED bar and the lovely neighbours I’ve been able to spend time with there. The road skirts around the outside of the estate with walkways between the units. Many have climbing plants that cut across from the ground level gardens up to the roof gardens, creating a little oasis of greenery. Children can play safely in these walkways and will run around the blocks without the worry of cars. As the sun sets in the evenings, there’s a feeling of intimacy around the estate as dinners are being prepared. The architecture is clever because despite the homes being close together, there’s enough privacy and it doesn’t feel like you’re living on top of each other. The car-free streets are one of the reasons I believe it’s easy to meet and get to know neighbours. Roads divide us. In the city, more often than not, they are places of pollution, danger and fear. It’s better when they are quiet or simply removed away from the front door. I was lucky to live with a view of the BedZED field. For many years, this field was a blank canvas. There were many inspired ideas from residents to do something, but little action. However, in the last few years, the field has come alive and has turned into an ecologically diverse, permaculture garden. Residents Tony and Danielle have been instrumental in making this happen and there are weekly gardening sessions every Saturday for anyone that would like to join in. While I can claim no part in helping out with this, I have a huge appreciation for everyone that goes out to make this space what it is. Living at BedZED, like many places, isn’t always bliss. You’ll hear neighbours often complain about Peabody, who manage the estate. The wider area is not much to speak of, in my opinion. Yet the homes are warm and the immediate landscape is clean and green. The neighbours are friendly and well-connected online and in-person. There’s a fantastic community centre, that’s in daily use by local residents. 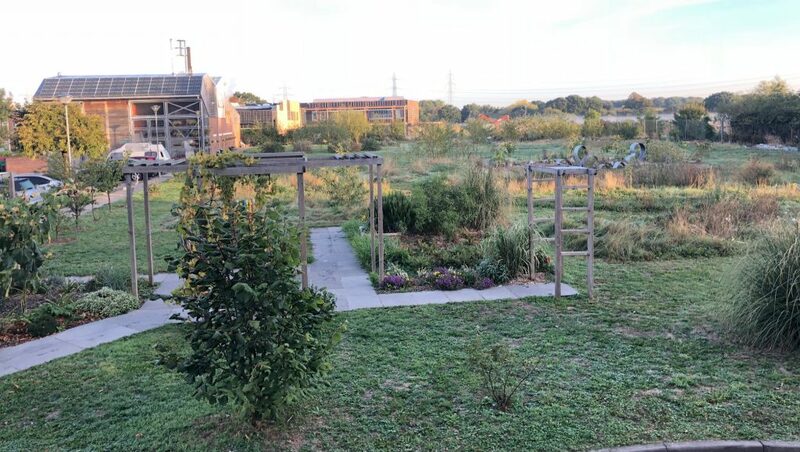 A green gym and permaculture garden. As a result, it’s an attractive place to live, particularly for families, many of whom don’t leave. One neighbour, I’m aware, has moved house three times within the development as their family has grown in size. For a few years, I managed a nearby farm called Sutton Community Farm that was also initiated by Bioregional and is now a thriving community-owned business. I often said to visitors at the farm, that if it wasn’t for BedZED, this farm would probably not exist. 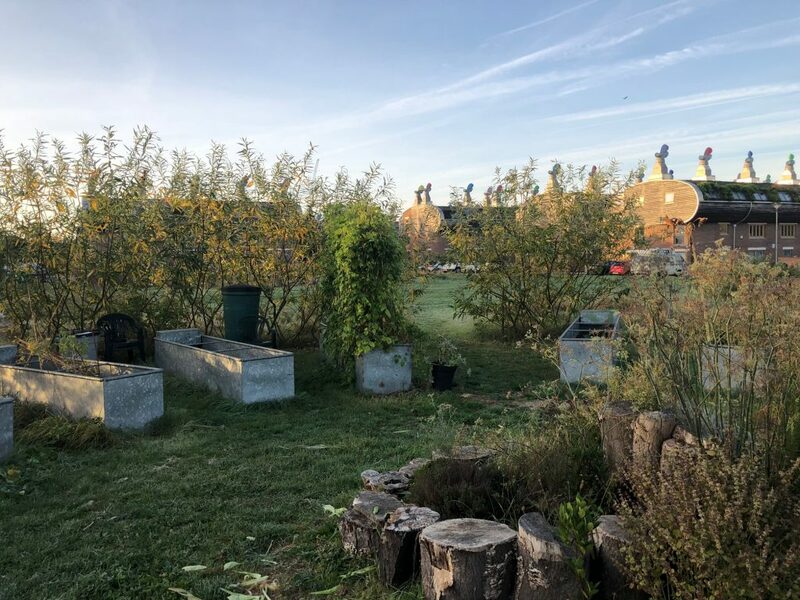 The ecological footprint studies of residents at BedZED, which showed food being the largest impact category, provided an important rationale for my colleagues to want to improve the local food system through a farm. I think having the experience of BedZED (not to mention Carshalton Lavender and other Bioregional enterprises) gave us more confidence to start a farm. In designing for sustainable communities, we found that it’s not enough to just build homes that perform well on energy and materials. To achieve One Planet Living, it’s necessary to design our communities with much more in mind. I sometimes found pessimist folk remind me of the inconvenient truth that BedZED was an expensive project with many failures. Well, I’m an optimist and my take is that BedZED was a pioneering and important development that’s gone on to inspire many. Indeed, it turns out the 99 electric car-charge points were excessive for the time (only now are electric cars starting to gain some popularity). The solar array system is not working (it was installed before the incentives of feed-in tariffs and has suffered from poor management). The Combined Heat and Power (CHP) plant was far too experimental and sized wrong (it’s now been placed by a biomass boiler). The Living Machine, a biological system for wastewater treatment that mimics the water purifying functions of wetlands, was also rather ambitious. It’s important to experiment though; that’s often how we learn the best lessons. Thankfully, many of the important aspects do work and BedZED provided a comfortable, warm and friendly place to live. Today, for various reasons, sustainability is still not at the forefront of the building industry. Sustainable builds are not happening with the ambition or at the pace they should be. My hope is that we continue to learn from BedZED but also remember it’s over 15 years old now. It’s old news. There should are hundreds of other developments we can look to for inspiration – unfortunately, I am struggling to name many of them.